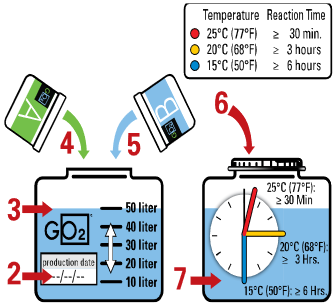 GO2 is a 4,000 ppm chlorine dioxide. This concentrate must be handled with care and all procedures must be followed according to the product label and the GO2 SDS. Creates a 0.4% oxidizing agent. Do not mix component powders together in dry form. Mix component powders only into water Do not mix with vinegar, hydrochloric, nitric or acetic acid or cleaning agents. Wear a NIOSH/MHSA-approved respirator appropriate for chlorine dioxide. When mixing and loading wear a chemical-resistant apron and chemical-resistant gloves. Maintain ventilation and maintain concentrate solution temperature below 100 Degrees Fahrenheit. ONLY USE AS DIRECTED PER THE PRODUCT USE GUIDE. TO DOWNLOAD PRODUCT USE GUIDE, CLICK HERE. Always read the material safety data sheet (MSDS) and follow this label’s safety instructions. Write down the date of preparation of the 4,000 ppm concentrate stock solution on the label of the container. The container must be UV proof, sealable, dark and resistant to oxidation. Fill the container with the exact amount of tap water shown on the label (1L, 5L, 10L, etc). NEVER USE LESS THAN THE AMOUNT OF WATER SHOWN ON THE LABEL OR EXCESS GAS PRESSURE COULD RESULT AND THE CONTAINER COULD BURST. First add COMPONENT A to the container with water.NEVER ADD THE POWDER TO AN EMPTY CONTAINER. ALWAYS ADD IT TO WATER. Follow by pouring COMPONENT B into the container. Gently swirl the liquid and securely close the container. Wait according to timetable below. Before use, verify concentration using chlorine dioxide test strip or a chlorine dioxide meter. If reading indicates lower than 4,000 ppm after reaction time has completed refer to Product Use Guide for application solution concentration adjustment. 4,000 ppm is based on tap water at our production facility. Your results may vary with local water conditions. GO2TM 4,000 PPM Concentration if ready for use. GO2TM Concentrate has a shelf life of approximately 30 days. The permissible exposure level based on a Time Weighted Average (TWA) . The TWA Represents the allowable average chemical concentration in air for a given period of time. Historically a work shift has been eight hours per day and this is often expressed as the allowable 8-hour TWA. The Short Term Exposure Level (STEL). The STEL is also known as the ceiling level. Exposure to concentrations in excess of this value should not be permitted regardless of duration. Monitors are available from various vendors to monitor levels of clo2 in the air. Please see our equipment page or contact us for more information.